Everyone wants to know how to day trade Emini S&P with short stack (i.e. next to no money) but no one really offers any proper answer to the question. There are claims that you can do it but not everyone can hit a lucky streak in the beginning nor being a good trader right from the start. I am going to tell you several realistic methods to allow you to eventually day trade Emini S&P with very limited starting capital. These methods have been used by some of the members of DaytradingBias.com. They managed to grow their accounts significantly over time. I am very impressed with their results. Their creative approaches to solve the problem of lacking initial capital are great examples for beginner traders to look up to. First, you have to understand that having the proper amount of money backing your trading is an important element in building a successful trading career. I have explained in How Much Money Is Needed For Trading Emini S&P the proper amount of capital you should have before you attempt to trade Emini S&P. I am not going to repeat what I have written there but you have to keep in mind that with extremely limited amount of money in your trading account means your chance of blowing it up, not because of your trading mistakes, but just market shocks, can be very high. Thus the effort you put into trading may not even be the deciding factor of your trading account being wiped out. It is important to keep this in mind all the time. The other factor affecting you when you trade with very limited starting capital is that stress can become a very significant problem leading to many more trading mistakes than you asked for. Hence, mentally you have to be prepared to accept total wipe out in the first place so that you can trade seriously without the psychological obstacle. Now that I have warned you, we will look at ways to bootstrap your way to build your trading capital. Many people who want to trade Emini have a fixation on the instrument because they understand that this market offers huge profit potential. But if you do not have enough trading capital to do it, you are much better off trying out alternative instruments that move with Emini S&P. 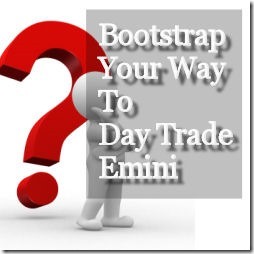 This is the first key element to successful bootstrapping your Emini S&P trading career. The alternative instrument you should choose must have much lower overall risk comparing to the Emini S&P. Emini S&P at the current 2000 level has a face value of $100,000 per contract. By choosing an alternative instrument having a much smaller face value, your limited capital can sustain much longer. By trading these alternative instruments, you get to gain the necessary trading experience and knowledge of the S&P index without risking too much money. You also get to learn the basics of proper trading if you do not have a strong trading background to start with. What it takes is patience so that you learn to trade the right way. 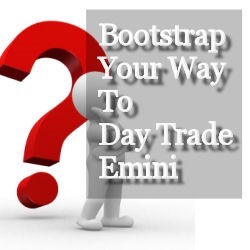 Since you will not be able to generate income from trading for a long time, as you have to grow your trading account slowly, the other key element to successful bootstrapping is having some kind of income to support yourself. Notice that you are not trading full time during this bootstrapping period. Hence holding a job is perfectly fine. What you have to commit, is your time outside of your job to learn to read charts properly so that you can apply this knowledge to swing trading the Emini S&P alternatives. It is a commitment that takes grit, not talent, to succeed. Contract for Differences (CFD) is a very common trading instrument in Europe and Asia. CFDs are usually offered by forex brokerages as they are similar in nature to forex for being dealer markets. Over the past few years, more and more forex brokerages started to offer micro sized CFDs on stock market indices and commodities, making them the much preferred choice for beginners to learn to trade these markets. For S&P CFD, many firms offer them at $1 per point movement in the S&P index. This means the face value for trading 1 unit of S&P CFD is about $2000 (when S&P index is at 2000). Since margin requirement is similar to Emini S&P (if not better), it allows someone with only a few hundred dollars to start trading the S&P index without over stretching their risk tolerance. One member who took a shot at trading Emini S&P back in 2008 has lost a lot of money. He joined DaytradingBias.com in 2010 and asked for help. I recommended him to stop trading Emini completely because he wanted to use his line of credit with the bank to stake his trading account. I told him to give S&P CFD a try with $2000 initial capital. This opened a whole new world to him and years later, he is a fine trader who trade S&P CFD and several other commodity CFDs. He has no plan to switch back to Emini S&P. Another member who contacted me right from the start told me he was new to trading and wanted to give Emini S&P a try with his $5000 savings. I convinced him to try S&P CFD instead. He has now learned to swing trade S&P properly with he trading account growing steadily. He has not decided yet whether he will switch to Emini S&P as the per contract capital need will greatly reduce his flexibility in scaling in and out of his positions. One thing important to remember is that you need to open your CFD trading account with a reputable firm. For non-US citizens, there are InstaForex and AvaTrade both are well-known names in the industry. If you are US citizen, FXCM is one of the biggest forex firms in United States. If you like to open your trading account with these firms, I have special deals arranged with them. Spyder (SPY) is the ETF of S&P 500 index. It moves closely with the Emini S&P but due to the stock market regulations, US brokerages enforce the Pattern Day Trader (PDT) minimum account requirement of $25,000. Hence it is an instrument even worse than Emini S&P for those without the trading capital for day trading. Since our goal is bootstrapping yourself to grow your trading capital, swing trading SPY and its options is a viable solution for those with around $5,000 to $10,000 trading capital. With limited amount of capital, SPY and its options offer a way to trade the S&P 500 index at a reduced overall exposure because each SPY single lot or one option contract is for 100 shares. SPY is trading near $200 per share. Hence the face value of the stocks involved per lot or contract is approximately $20,000, one fifth of the face value of one Emini S&P contract. This allows someone with limited capital to trade more easily. The advantage of trading with SPY and its options is that many people already have stock brokerage account and that stock trading is often a familiar subject comparing to trading CFDs or forex. There is a catch though with this bootstrap approach – the PDT regulations can make it difficult to unload an open position as the market making sudden changes. So there is a risk of not able to manage your trading position at the worse possible time. Several members thanked me for the warning of the risk of trading Emini S&P. They love the idea of eventually trading Emini so they choose to trade SPY and its options as they have experience trading stocks. One find S&P moving “too fast” intraday so he decided to focus on stocks since. The others are still working on their chart reading chops as they learned that S&P moves quite differently comparing to the junior stocks that they are more familiar with. Contrary to what many people think, trading competition is a very lucrative business by itself. Some people actually make a living by competing in trading competitions all year round. There are many trading competitions out there happening every month. Some trading competitions are competed with demo accounts only so the risk involved is limited. Some brokerages offer trading competition to all their clients every month. The top performers of the month will win cash prizes among many other things. The competitions are often categorized by the amount of money in the account. So winners do not necessarily win by making the most amount of money. Instead, other metrics are used to determine who has done a good job. You probably think that I am kidding here. A beginner trader trying to win trading competitions sounds impossible. The truth is, many trading competitions are created for the small accounts where majority of the traders having these accounts are beginners. So the competition among the traders is fierce but everyone do get a chance. FXCM used to hold a King of the Mini contest for several years but then they stopped. InstaForex is famous for holding all kinds of competitions every month including some that does not involve real money. One member who emailed me his experience with these competitions is as surreal as it gets. He was a stock day trader back in early 2000s. He made a lot of money and lost most of it. He then learned about forex and started trading that actively. He discovered several trading competitions for small account traders. He went ahead and opened accounts at these brokerages with the minimum required account balance so that he was eligible to these competitions. By controlling the starting capital as small as he could, he boosted his performance on percentage gain basis. He has won 1st place twice and many other minor prizes. In the beginning, all he wanted was making back the money he lost from trading stocks “like a mad man”. As he worked hard from competition to competition, the goal setting mentality transformed him into a very good trader. 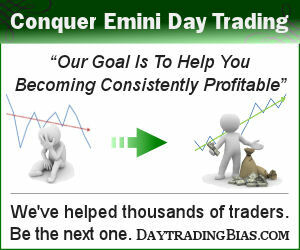 He is now trying his hands on Emini S&P while his main focus is swing trading forex majors. He has “retired” from the trading competition scene. The most important rule with trading is to protect your trading capital. Starting out to trade Emini S&P with a tiny sum of money goes against this fundamental rule and will likely lead to failure in your pursuit of a trading career. It is much more constructive by learning to trade the S&P index in a controlled environment where the risk you are putting up is something you are comfortable with and affordable to. Trading S&P CFD is a good alternative. If you are not comfortable with that, you can try SPY and its options instead. Until you master the basics and begin to consistently making money from the lower risk alternatives, there is really no point to force yourself into trading Emini S&P. After you are getting good at swing trading the S&P index, you still need to accumulate enough capital before switching over to trade Emini S&P. The actual decision to switch or not will depend on your situation by the time you can afford to make the decision. As mentioned earlier, some people like the way the S&P CFD works and choose to stick with that while others simply discover that trading indices is not their cup of tea.